The first thing you need to decide is which of your web pages fall into which point category. Don’t base your points on where you are getting the most leads but on where your leads have converted in the past. A pricing page or demo request page is a clear indication your lead is interested in your business and therefore earns more points. The homepage or a contact us page, while a lot of leads go there, it is not an indication that the lead is ready to buy. Therefore, it gets less points. Creating page categories makes it easier for you to assign scores to multiple pages. Once you’ve decided which categories you want to use and which pages go into them, here is how to set them up on GatorLeads. Where do you create new Categories? When you log into GatorLeads there is an option in the top navigation called “Admin”. Click this link and follow the path through “Page Admin” and into “Categories”. Once you are in the “Categories” section, you can add a new category simply by typing in the box at the top of the page and clicking "Add". Once the categories have been created you can move onto assigning pages to the categories that have been created. You can assign pages to categories by navigating yourself to the page section in GatorLeads Admin - Page Admin - Page Scores. The search box will expand. You then have the option to categorise all the links that appear by clicking on the Categories drop down and selecting the Category that you wish to assign the pages to. If you would only like to categories a single page, find the page using the search button and then click the edit button. 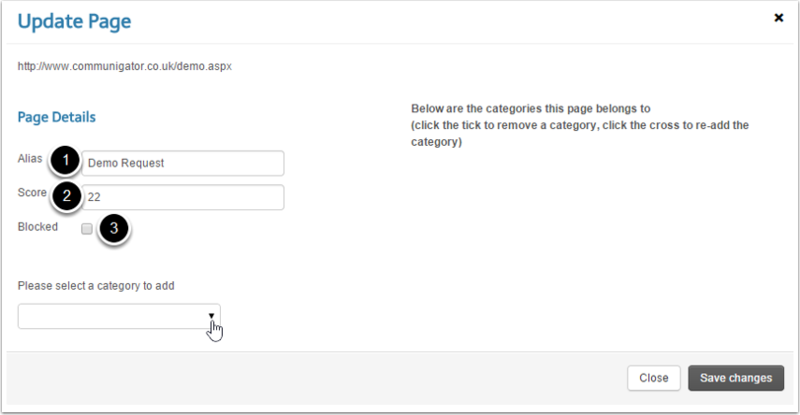 This navigates you to the update page where you can enter an alias, change the page score and select the category that you would like to associate the page with.